In appointing Anna Caballero, Gov. Jerry Brown begins to demonstrate pledge to Latino community. SACRAMENTO, CA - California Governor Jerry Brown has appointed State Assemblymember Anna Caballero as Secretary of the State and Consumer Services Agency. In doing so, Brown begins to demonstrate his pledge to California’s Latino population to make them a vital part of his administration. As Secretary of the State and Consumer Services Agency, Caballero will oversee thousands of employees in vital departments and boards that protect consumers, license physicians, and manage public employee retirement systems. Caballero, 56, of Salinas, had previously served in the California Assembly representing the 28th District, until her failed bid for election to the State Senate. An attorney, she launched her legal career in 1979 working as a staff attorney for California Rural Legal Assistance, representing farm workers in consumer matters. She was a partner in the law firm of Caballero, Govea, Matcham and McCarthy from 1982, which changed its name in 1995 to Caballero, Matcham and McCarthy. 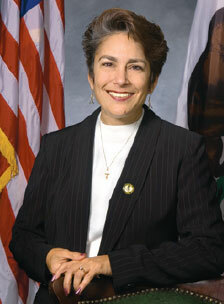 In 1991, she was elected to the Salinas City Council and served as City Mayor from 1998 to 2006. In addition, she was the Executive Director of “Partners for Peace” from 2000 to 2006. Caballero will be taking the reins of an Agency which houses the powerful Public Employment Retirement System and the State Teachers Retirement System, each controlling many billions of dollars and both involved in heated debates about pension reform. In addition, she will oversee the state’s key hiring board, the State Personnel Board, and the state’s primary purchaser and contractor, the Department of General Services. Caballero, a Democrat, is a graduate of the University of California, San Diego and attained her Juris Doctor from the University of California, Los Angeles. Her appoint will require Senate confirmation.